Are Those Coerver Coaching DVDs Worth It? Well, the short answer is YES those Coerver Coaching DVDs are unique and worth buying since they teach you the fundamentals of soccer. The Coerver Coaching Method simply works and it makes you a better soccer player and or soccer coach. So yeah, those Coerver dvds are worth it if you're trying to improve your game and play at a high level. Really, if you want to become the best soccer player you can be, then it's certainly worth it to buy those Coerver dvds. If you want to develop and become a better soccer coach, then the Coerver method is the way to go too. There’s no doubt you should watch the Messi, Beckham, and Ronaldinho on TV, and copy/steal their moves. But with Coerver Coaching DVDs, you’re buying not just getting a set of videos with moves and skills but a philosophy and a style of play that can trampoline a young soccer player from an average player to a great soccer player. That's why the Coever DVDS are worth buying - they help you understand the game better and learn the fundamentals of the game. Of course, this is only if said young soccer player puts in the time and effort on the training ground - meaning they're striving to get better and practicing on their own day in and day out. No DVD is a magic solution, but the Coerver DVDs and their coaching method can help players make big strides and improve. Want Soccer Practices That Players Enjoy? You'll get all this & much more from this coaching course. Take it from the comfort of your home. Don't delay joining & furthering your education in technical skills training. So much of being a good soccer player is about confidence. To gain that confidence you have do the work so the soccer skills are there to make those passes, beat those defenders, score those goals, and so on. Coerver's DVDs can help build up a player's confidence if he or she is willing to put the time in and master the moves and skills. With the Coerver basics in place, players have the confidence to take players on and make those killer passes and thus gain even more confidence. And there’s a reason that Coerver DVDs have been around the past twenty-five years: their DVDs are of a high quality and their methoeds provide a foundation for any soccer player who wants to become the best player they can be. The Coerver soccer training methods are more than just a foundation, though. Every drill or movement is done with the ball. This is a huge difference from a lot of the other coaching styles or DVDs on the market. This is what makes the Coerver method unique, they focus on ball control and a player's touch on the ball. But the Coerver Coaching method is not just about the ‘soccer ball’ either, and becoming comfortable with it, it’s about being confident with the ball and knowing what to do when you get the ball at your feet. The idea is not just to be able to pass and control the ball but master it. From toe taps on top of the ball to tapping the ball back and forth with the inside of the feet to cutting inside and outside with both feet, these are the skills that every soccer players should have as a foundation of their game. If you look at any moves at player makes, it usually involves a Coerver technique at its core. Simply passing the ball from one inside of the foot to the other is a move that's used time and time again at the highest level. To some, all these toe taps seem silly. Some say it's what's bad about Coerver DVDs. These skills, all the massaging of the ball with your feet, rolling it back and forth, and then to the side, it’s not really part of the real game you watch in the English Premier league or La Liga. The truth is, it’s actually a very big part of the game since the game is all about being confident on the ball. Again, these Coerver drills and moves give you that base to build off of. It's a foundation that enables you to cut, turn, spin, roll, and dribble away from pressure, and can then pass, shoot, and score when those opportunities arise. The Coerver method goes beyond being comfortable and confident on the ball. The key concepts in soccer, of changing direction, starting and stopping, and feints, are at the core of the DVDs. Coerver wants to develop players and coaches who play with a joy and have fun. To develop players who have perfect control and touch on the ball, and are then able to attack defenders and create goal-scoring chances. 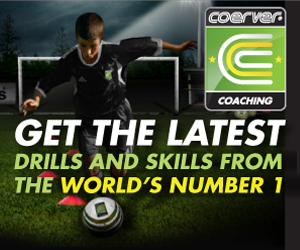 Also, the Coerver DVDs give players, parents and coaches something to refer back to when they’re working on a skill. And there are a multitude of soccer skills, moves, and turns to work on in the DVDs. The DVDs can act sort of like a reference guide to refer back to. The videos function like a dictionary for your soccer foundation. As a soccer player, to get better, to become a college or professional soccer player, you have to spend a lot of time on your own with the ball. And you do that because you love to play, you want to get better, and you want to play at the highest level. Really, you want to score big goals, make that killer pass, and hear the crowd sing your name. Why not dream big. If you don’t dream and picture yourself playing at the Camp Nou or the Theatre of Dreams, if you don’t imagine the crowd cheering after you score, how are you ever going to get there? So, if you’re a parent, a coach or a player, these DVDs are well worth the purchase. They can help you get to the highest level. And why wouldn't you want to have every tool available to you if you want to play college or pro soccer? If you pick up just three or four things from the Coerver DVDs that help you improve your game, then they're well worth it. Let's put it this way, wouldn't a set of 5 DVDs for under $100 be worth it if they helped you get a college soccer scholarship? Again, these DVDs aren't magic. Soccer is about mastering the ball and then applying those skills in a fast paced game. The Coerver coaching methods will push you in the right direction, give you the concepts, the drills, and the moves, but you have to play in as many games as possible and play with and around the best players you can play with to get to the highest level. In other words, you still have to put the work in. And when you see Ronaldinho, Messi and Beckham playing for their respected clubs, you'll see they're doing a lot of Coerver type moves and turns with the ball themselves. To get to where they are, you just have to keep pushing yourself and practicing. 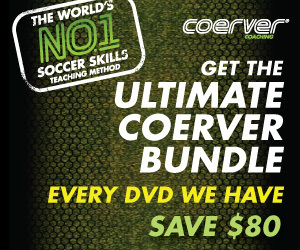 Get your Coerver DVDs here.